A while back, I did an analysis of the family network of major characters from the A Song of Ice and Fire books and the Game of Thrones TV show. In that analysis I found out that House Stark (specifically Ned and Sansa) and House Lannister (especially Tyrion) are the most important family connections in Game of Thrones; they also connect many of the story lines and are central parts of the narrative. In that old post, I used igraph for plotting and calculating network metrics. 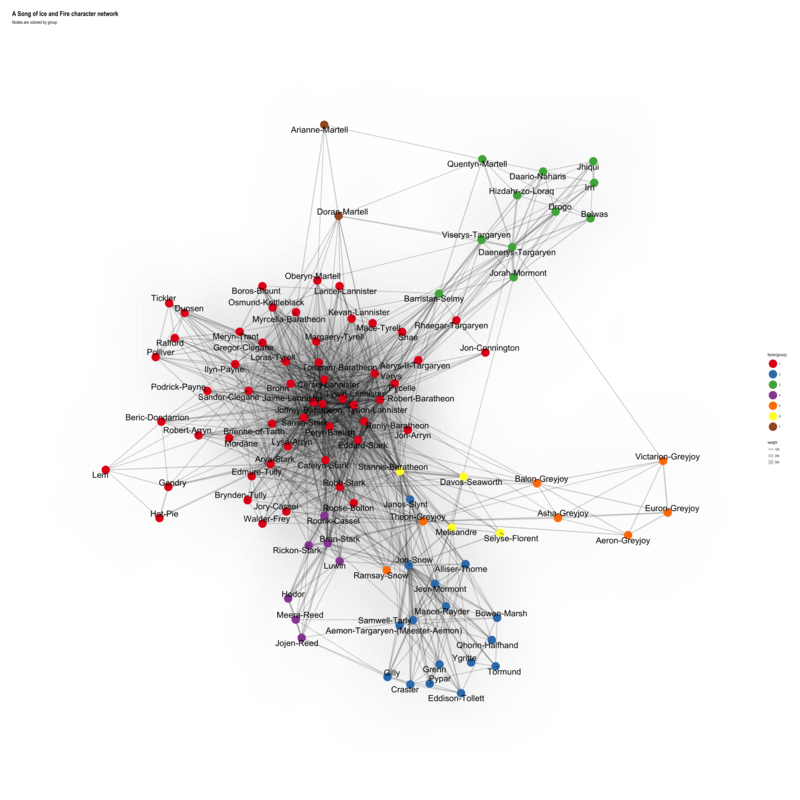 But there are two packages that integrate network analysis much more nicely with the tidyverse: tidygraph and ggraph. These, I am going to show how to use for analyzing yet another network of characters from A Song of Ice and Fire / Game of Thrones (to be correct, this new network here is strictly based on the A Song of Ice and Fire books, NOT on the TV show). 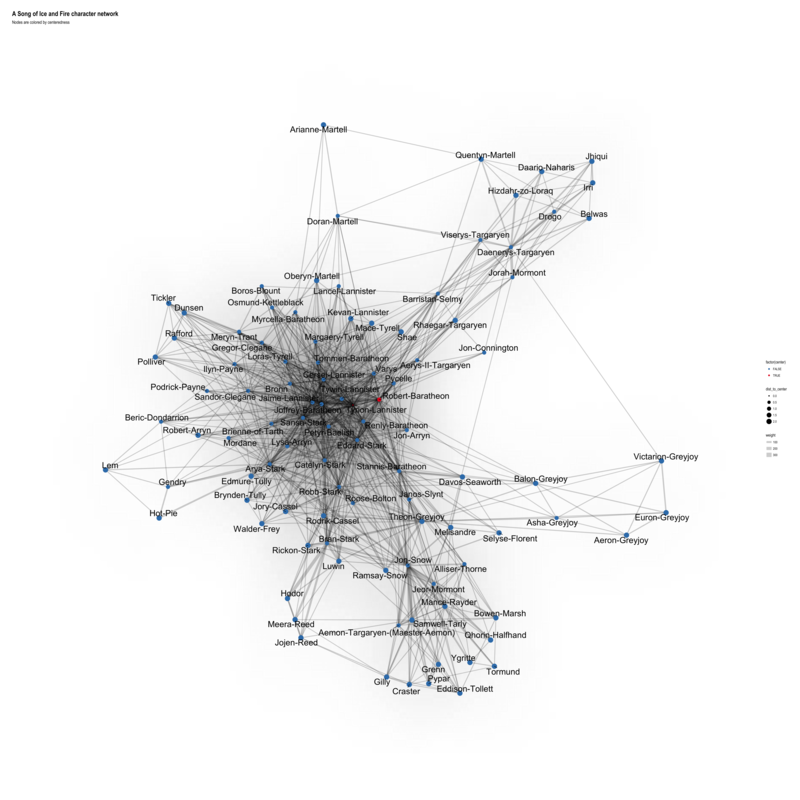 What can network analysis tell us? How many connections does each person have? Who is the most connected (i.e. influential or “important”) person? Are there clusters of tightly connected people? Are there a few key players that connect clusters of people? These answers can give us a lot of information about the patterns of how people interact. So, how do we find out who the most important characters are in this network? We consider a character “important” if he has connections to many other characters. There are a few network properties, that tell us more about this, like node centrality and which characters are key-players in the books. A word of caution before you read on: BEWARE of SPOILERS for all books! Character Interaction Networks for George R. R. Martin’s “A Song of Ice and Fire” saga These networks were created by connecting two characters whenever their names (or nicknames) appeared within 15 words of one another in one of the books in “A Song of Ice and Fire.” The edge weight corresponds to the number of interactions. You can use this data to explore the dynamics of the Seven Kingdoms using network science techniques. For example, community detection finds coherent plotlines. Centrality measures uncover the multiple ways in which characters play important roles in the saga. Andrew already did a great job analyzing these character networks and you can read all his conclusions on his site https://networkofthrones.wordpress.com. Here, I don’t aim to replicate his analyses but I want to show how you could do this or similar analyses with tidygraph and ggraph. Thus, I am also not going to use all of his node and edge files. The first data set I am going to use are the character interactions in all five books. I am not using the node files here, because I find the edge names sufficient for this demonstration. If you wanted to have nice name labels, you could use the node files. Because there are so many characters in the books, many of them minor, I am subsetting the data to the 100 characters with the most interactions across all books. The edges are undirected, therefore there are no redundant Source-Target combinations; because of this, I gathered Source and Target data before summing up the weights. The first step is to convert our edge table into a tbl_graph object structure. Here, we use the as_tbl_graph() function from tidygraph; it can take many different types of input data, like data.frame, matrix, dendrogram, igraph, etc. A central aspect of tidygraph is that you can directly manipulate node and edge data from this tbl_graph object by activating nodes or edges. When we first create a tbl_graph object, the nodes will be activated. We can then directly calculate node or edge metrics, like centrality, using tidyverse functions. We can change that with the activate() function. We can now, for example, remove multiple edges. When you are using RStudio, start typing ?edge_is_ and wait for the autocomplete function to show you what else is possible (or go to the tidygraph manual). There are many options for node ranking (go to ?node_rank for a full list); let’s try out Minimize hamiltonian path length using a travelling salesperson solver. Centrality describes the number of edges that are in- or outgoing to/from nodes. High centrality networks have few nodes with many connections, low centrality networks have many nodes with similar numbers of edges. The centrality of a node measures the importance of it in the network. Again, type ?centrality for an overview about all possible centrality measures you can use. Let’s try out centrality_degree(). We can use ?group_graph for an overview about all possible ways to cluster and group nodes. Here I am using group_infomap(): Group nodes by minimizing description length using. These functions all lets the user query whether each node is of a certain type. All of the functions returns a logical vector indicating whether the node is of the type in question. Do note that the types are not mutually exclusive and that nodes can thus be of multiple types. Similarly to node metrics, we can calculate all kinds of edge metrics. Betweenness, for example, describes the shortest paths between nodes. More about what you can do with edges can be found with ?edge_types and in the tidygraph manual. ## 4     1    32 Undirected    53     20         0. ##  4     1    32 Undirected    53     20         0. ##  7     1    42 Undirected    57     25         0. ##  8     1    48 Undirected    58    110         0. First, I am going to define a layout. There are lots of options for layouts, here I am using a Fruchterman-Reingold algorithm. The rest works like any ggplot2 function call, just that we use special geoms for our network, like geom_edge_density() to draw a shadow where the edge density is higher, geom_edge_link() to connect edges with a straight line, geom_node_point() to draw node points and geom_node_text() to draw the labels. More options can be found here. Interestingly, many of the groups reflect the narrative perfectly: the men from the Night’s Watch are grouped together with the Wildlings, Stannis, Davos, Selyse and Melisandre form another group, the Greyjoys, Bran’s group in Winterfell before they left for the North, Dany and her squad and the Martells (except for Quentyn, who “belongs” to Dany - just like in the books ;-)). The big group around the remaining characters is the only one that’s not split up very well. The second data set I am going to use is a comparison of character interactions in the five books. A little node on the side: My original plan was to loop over the separate edge files for each book, concatenate them together with the information from which book they are and then plot them via faceting. This turned out to be a bad solution because I wanted to show the different key-players in each of the five books. So, instead of using one joined graph, I created separate graphs for every book and used the bind_graphs() and facet_nodes() functions to plot them together. Getting started with RMarkdown & trying to make it in the world of Kaggle. Join MünsteR for our next meetup! In our next MünsteR R-user group meetup on Tuesday, April 9th, 2019, we will have two exciting talks: Getting started with RMarkdown and Trying to make it in the world of Kaggle! You can RSVP here: http://meetu.ps/e/Gg5th/w54bW/f Getting started with RMarkdown First, Niklas Wulms from the University Hospital, Münster will give an introduction to RMarkdown: He started using R in 2018 and learnt the advantages of using only one framework of free software and code. Today, I am happy to announce the launch of our codecentric.AI Bootcamp! This bootcamp is a free online course for everyone who wants to learn hands-on machine learning and AI techniques, from basic algorithms to deep learning, computer vision and NLP. However, the course language is German only, but for every chapter I did, you will find an English R-version here on my blog (see below for links). Right now, the course is in beta phase, so we are happy about everyone who tests our content and leaves feedback. Disclaimer: Manning publications gave me the ebook version of Beyond Spreadsheets with R - A beginner’s guide to R and RStudio by Dr. Jonathan Carroll free of charge. Beyond Spreadsheets with R shows you how to take raw data and transform it for use in computations, tables, graphs, and more. You’ll build on simple programming techniques like loops and conditionals to create your own custom functions. You’ll come away with a toolkit of strategies for analyzing and visualizing data of all sorts using R and RStudio. In the past, I have written and taught quite a bit about image classification with Keras (e.g. here). Text classification isn’t too different in terms of using the Keras principles to train a sequential or function model. You can even use Convolutional Neural Nets (CNNs) for text classification. What is very different, however, is how to prepare raw text data for modeling. When you look at the IMDB example from the Deep Learning with R Book, you get a great explanation of how to train the model. My course on Hyperparameter Tuning in R is now on Data Camp! I am very happy to announce that (after many months) my interactive course on Hyperparameter Tuning in R has now been officially launched on Data Camp! Course Description For many machine learning problems, simply running a model out-of-the-box and getting a prediction is not enough; you want the best model with the most accurate prediction. One way to perfect your model is with hyperparameter tuning, which means optimizing the settings for that specific model. These are slides from a lecture I gave at the School of Applied Sciences in Münster. In this lecture, I talked about Real-World Data Science and showed examples on Fraud Detection, Customer Churn & Predictive Maintenance. Real-World Data Science (Fraud Detection, Customer Churn & Predictive Maintenance) von Shirin Glander The slides were created with xaringan. As with the other videos from our codecentric.ai Bootcamp (Random Forests, Neural Nets & Gradient Boosting), I am again sharing an English version of the script (plus R code) for this most recent addition on How Convolutional Neural Nets work. In this lesson, I am going to explain how computers learn to see; meaning, how do they learn to recognize images or object on images? One of the most commonly used approaches to teach computers “vision” are Convolutional Neural Nets. Don’t reinvent the wheel: making use of shiny extension packages. Join MünsteR for our next meetup! In our next MünsteR R-user group meetup on Tuesday, February 5th, 2019, titled Don’t reinvent the wheel: making use of shiny extension packages., Suthira Owlarn will introduce the shiny package and show how she used it to build an interactive web app for her sequencing datasets. You can RSVP here: http://meetu.ps/e/Gg5th/w54bW/f Shiny is a popular R package for building interactive web apps and dashboards – no web development knowledge required! Registration is now open for my 1.5-day workshop on how to develop end-2-end from a Keras/TensorFlow model to production. It will take place on February 21st & 22nd in Berlin, Germany. The workshop will cost 950.00 Euro + MwST. We will start at 9 am on Thursday and finish around 3 pm on Friday. Please register by sending an email to shirin.glander@gmail.com with the following information: name company/institute/affiliation address for invoice phone number reference to this blog The course material will be in English and we will speak a mix of German and English, depending on the participants’ preferences.